David Haye signs contract for Fury clash on Sep 28th - Breaking News! David Haye signs contract for Fury clash on Sep 28th – Breaking News! By Scott Gilfoid: David Haye (26-2, 24 KO’s) has reportedly signed a contract to face unbeaten British heavyweight Tyson Fury (21-0, 15 KO’s) at a still to be determined venue. The only thing that is keeping the fight from being a solid right now is Fury signing the contract as well, and all you can do is hope that he signs for the mega domestic clash. Once Fury signs the contract you can pretty much say it’s over the the 6’9″ fighter because he’s got no chance against Haye, and he’s going to be totally exposed in this fight. That’s not to say that Fury’s career will be over, because he’s certainly young enough to rebuild after a 1st or 2nd round knockout loss to Haye. But once Fury gets destroyed by Haye, will be seeing Fury slip into the same area where fellow British heavyweight David Price is right now in having to rebuild at the domestic or European level from the ground up. 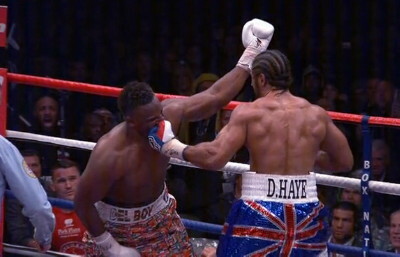 I can’t see Haye giving Fury a rematch if he knocks him out in one or two rounds. Haye will move on and go after a world title shot rather than doing what Tony Thompson did and giving the beaten fighter a rematch when it’s not even necessary. That would be worse than a Carl Froch vs. Mikkel Kessler 3 fight because Fury won’t make it the full 12 rounds against Haye. It’s going to be over quickly with a brutal ending for Fury. This fight will show you why it’s not a good idea to put untested heavyweights without defense and any real accomplishments in the ring with ex-world champions while they’re still relatively in their prime. Fury doesn’t belong in the ring with Haye, and it’s going to be pretty clear once the first solid right hand from Haye nails Fury in the grill. Boxing » David Haye » David Haye signs contract for Fury clash on Sep 28th – Breaking News!